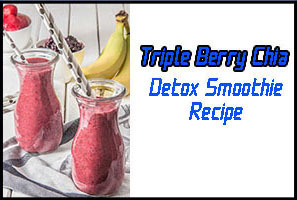 If you’re like me and have been on a big detox smoothie kick lately then it’s recommended you try the Triple Berry Chia smoothie. This rich and creamy detox smoothie comes filled with great fruits that will blend together nicely in order to make a fantastic smoothie! Its unique combination of fruit gives it a vibrant pink color that tastes slightly sweet and tart. You can even choose to eat it with a spoon! Best of all, our triple berry chia detox smoothie is vegan so it has no saturated fat or cholesterol! Gather all of the required ingredients below and follow the directions to quickly make this yummy smoothie right now. Total prep time for the triple berry chia smoothie is about 15 minutes! 1) Start by adding the chia seeds and water into a mixing bowl. Then, stir until all seeds have been soaked. Finally, place the bowl in the refrigerator. 2) Meanwhile, add the strawberries, blackberries, raspberries, bananas, and agave (optional) to a food processor or blender. Pulse until ingredients are pureed. 3) Remove the mixing bowl from your fridge. If you look, the chia seeds should have absorbed most of the water, forming a gel-like consistency. Next, add the chia mixture to the food processor and pulse again until well combined. Serve immediately. 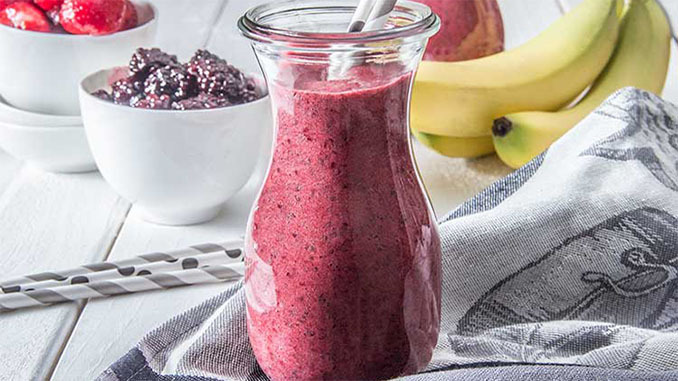 Storage: The triple berry chia smoothie will hold up for 3-4 days if stored in your homes refrigerator (be sure to cover in an airtight container). Alternatively, portion individual servings of the smoothie into covered, airtight containers and freeze; thaw in the fridge before serving. This detox smoothie recipe is packed with tons of detoxifying and hunger-satisfying fiber (13 g per serving), filling protein (5.8g per serving), manganese, potassium (12% DV per serving) and tons of immunity-boosting vitamin C (82%DV per serving). This recipe makes six generous portions. You can easily store individually sized portions in your fridge or freezer to quickly snack on anytime!